1) I'd like to sort out the changing of socket covers in my house started years ago. Not being in the market for 240v AC to be applied to my body I used a plug in light to check if sockets were shut off so I could do the wiring involved when replacing power sockets. There is one socket in my house which remains live when I switch off ALL the fuses, which is scary enough. Bu this also remains live when I turn off the main breaker to the house. I'd like to sort this, or wire everything else into it if it is not on my bill. And add a tuned TDI and 6sp instead of the (yawn) Rover V8 and Range Rover box. 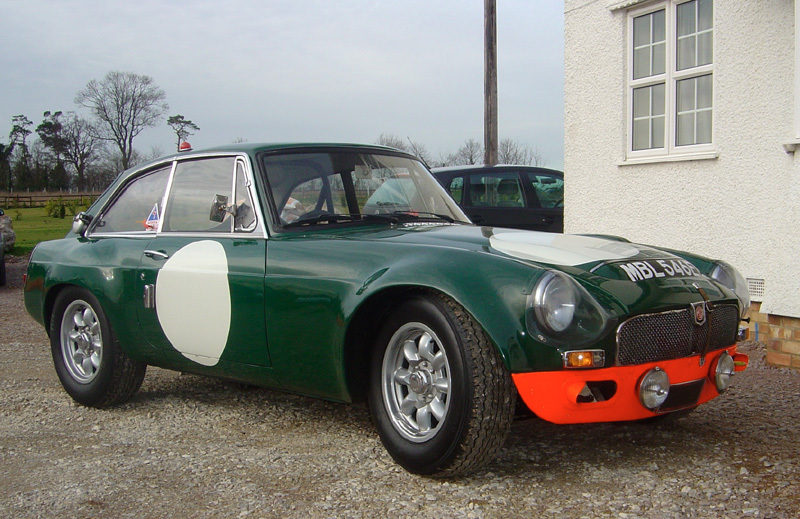 The MGB is quite light (compared to e.g. a Golf TDI) so I think it might "Go" quite well and use very little fuel. 3) I want to get a cheap 106 / Saxo / AX 1.5 D and mod it a lot in terms of lightness and using veggie oil in it. All of these cars are more or less the same. Check out Neal Young's "LincVolt". My respect is even greater, knowing you're in possession of an MGB GT. My roomate in college had the MGA coupe. I'm letting go of the '61 VW panel van I've owned since 1978.
jamesqf -- Are you seeing what I'm seeing? The Manx body on a full length, unshortened frame would lay out about like this (the ermini seiottosei). A front air dam, lengthened side sill and rear fenders and the Superbeetle windshield and you're about there. The original sill could becomes a door jamb under a butterfly door that raises the window line (since you don't need to step over) and contours iinto a new rear fender and valance. Power could be anywhere from 36hp hanging off the rear to 4 inwheel 100hp electric motors and a massive battery amidships. Just so I can say—today I sat in a 2015 Golf. Those are the seats you want in this. As for that big engine bay the race car has? I'd want a little pickup box at the center of mass rotation, with a varnish wood floor and metal runners. And the boxer motor bringing up the rear, but with the exhaust run forward and up to tips in the sail panels, like the Porsche 918. 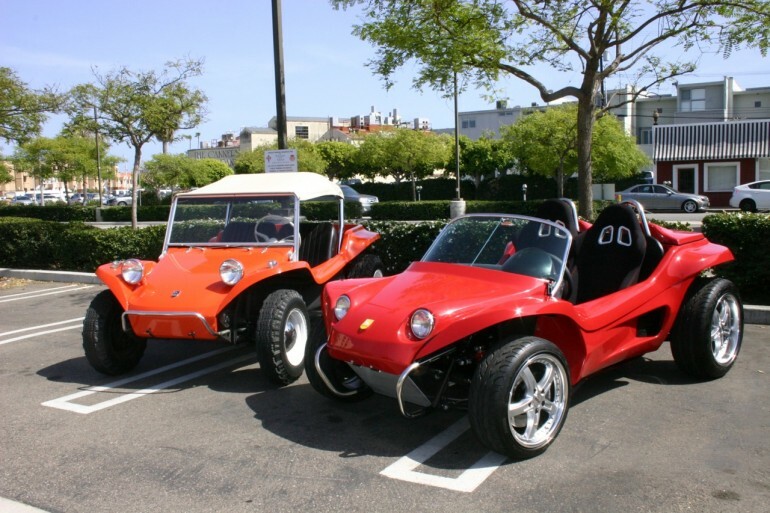 Last edited by freebeard; 07-12-2014 at 07:11 PM..
Just your first picture, of the two dune buggies. I'd take the one in front. The Manx body on a full length, unshortened frame would lay out about like this (the ermini seiottosei). A front air dam, lengthened side sill and rear fenders and the Superbeetle windshield and you're about there. Not at all what I'm thinking about. The goal of my project would be something that's good to drive on dirt roads (while of course being able to handle the pavement involved in getting to/from the dirt). So it should have decent ground clearance, while still being low-slung enough for good aero and comfortable seating, unlike the jacked-up Jeeps and SUVs. It's not for off-road driving, just off-pavement. Fair enough. I learned to drive on gravel roads, practising drifting in a straight line. Something more like a Class 5 stance then? By the time you get to those long-travel, stretched suspensions, you'll need a multi-point roll cage and full cell. Don't ignore the one in the backgound. That's Old Red, the first Meyers Manx. Lookin' good for it's age. 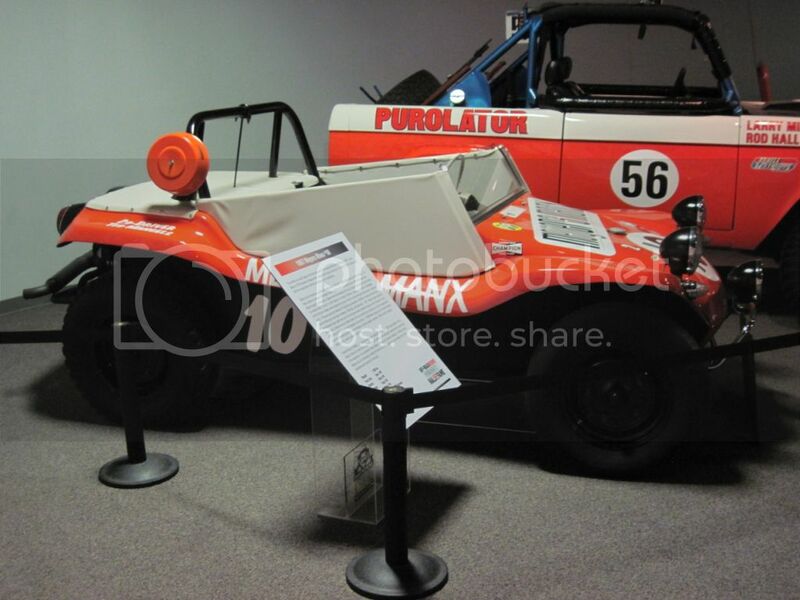 This is a replica of #10—the one that won the first Baja 1000. It's pretty low. I'd also like to put a Mustang SVO turbo four into a rust bucket Pinto and watch the smug grins on BMW drivers' faces disappear when they get beat by one. I am told it's a weekend swap, being that it is the same block and stuff as a stock 2.3 OHC. The next weekend you can do the [drum] brakes. I drove one of these as a company car, where I worked, a few times. I had a friend that had one with a built 351W in it. Was quite the sleeper until he started it up. The cops didn't take us seriously when it was stolen. I also found Volvo's to be great sleepers. My Harley is good for sucking up and spitting out busas. Another option is a festiva with a Capri XR2 drivetrain.